Manufacturer of a wide range of products which include instant masala grinder and spice grinders. 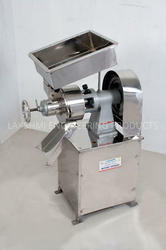 Being a prominent leader of market, we are involved in presenting a wide range of Instant Masala Grinder. Offered Instant Masala Grinder is used to grind various spices, which is used as an ingredients for preparing dishes.Available in various motor capacity, this Instant Masala Grinder is available with us n variety of motor capacity and good range. Being a prominent leader of market, we are involved in presenting a wide range of Spice Grinders (Chilli Grinding Machine). Offered Instant Masala Grinder is used to grind various spices, which is used as an ingredients for preparing dishes.Available in various motor capacity, this Instant Masala Grinder is available with us n variety of motor capacity and good range.